Grounding Kit for 3M(TM) Static Protective Hard Laminate includes #10 screw, lock washer, #10 nut, lock washer wing nut, #10 self-tapping screw and one 10 ft. (3.0 m) ground cord. Ground cord has a 1 megohm resistor. Jaco Aerospace and Industrial is your one stop resource for 3M(TM) Accessories - Grounding Kit, 3041 and all of your 3M Products, Tapes, aerospace and industrial needs. 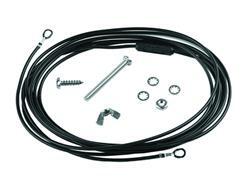 SKU Marketplace Product Description: Grounding Kit for 3M(TM) Static Protective Hard Laminate includes #10 screw, lock washer, #10 nut, lock washer wing nut, #10 self-tapping screw and one 10 ft. (3.0 m) ground cord. Ground cord has a 1 megohm resistor.